Happy (belated) Easter Sunday CTG faithful! For some of us here, this Sunday marks a pretty pivotal point in our lives: the mark of the final stretch in the countdown to Marvel’s first collaborative series with Netflix, Daredevil. Regardless of religious affiliation, I think we can all appreciate that much. Matt Murdock, Hell’s Kitchen’s own resident street brawler/ninja/swash buckler/acrobat is himself a fairly devout catholic; in fact, his mother is even revealed to be a nun in a local ministry (see Daredevil: Guardian Devil). 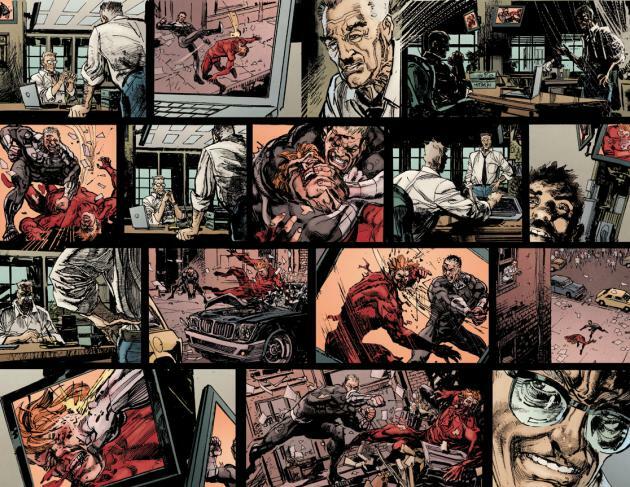 But that’s about as that connection fits in with today being Easter and all – in anticipation of the new Daredevil series, I’ve decided to take a look at one of the most interesting arcs/events in recent years, namely the good devil’s end. Daredevil: End of Days is the story not just of how Daredevil goes down, but of his legacy and impact upon Hell’s Kitchen and even his world at large – which is big for a street level hero. The night is dark, and the first thing we get to see is Daredevil brawling in the middle of the street with longtime nemesis Bullseye, and things ain’t looking to good. Before being put down like a dog in the street (with his own baton, no less), Mattie gets one word out to Bullseye, throwing him into the frenzy that spells his end. And that word? “Mapone.” And just like that, The Kitchen’s “Red Batman” is put down before a crowd of onlookers and social media junkies recording the incident, as we are cast into a noir-esque tale of superpowers, death, and descent. Also nice is that our protagonist, for the most part, is the Daily Bugle’s own Ben Urich, as we follow him in a quest to discover the nature and intent of Daredevil’s last word, as well as the circumstances leading up to his death. Through his harrowing investigative report, however, we come to find out that in his dying days, the devil was a very different man than many of us are familiar with. Even though I initially said End of Days was a good send off for Daredevil, please allow me to clarify in saying that it did not paint Matt in the best light in doing so. The vigilante we see is a much darker, brutal version of the beloved hero who’s willing to go after the villains who’ve haunted him for so long, and ties up loose ends in manners that would daunt most readers familiar with the character, especially considering the lighthearted fashion in which Waid’s current run typically portrays the character (well, at least the first 36 issues more so than the more recent issues). At one point, Matt goes out of his way to kill a seemingly reformed Kingpin who refuses to leave New York at the former’s behest. But how does all of this tie into the upcoming Netflix series? Well, from the get go Marvel has made its intent with the Defenders tie-ins clear in wanting to develop a darker portrayal for their timeless heroes – especially considering the fact that Jessica Jones and Matt Murdock in particular have some of the darkest back stories when compared to the likes of Rand and Cage. All this to say that if Marvel follows suit as well as the direction and tone of series such as End of Days, Miller’s, and Bendis’s runs, we could be looking at something more reminiscent not of a developmental vigilante, but one who has already tried the good/lawful methods and now seeks for something more chaotic and violent to save his city. All in all, End of Days is a brilliant homage to a character who’s had a weird enough timeline and life to have seen some serious change more oft than not in the form of tragedy and the making of hard decisions. Yeah, Daredevil isn’t the first hero people jump to when you talk about Marvel comics or even heroes that you would want to see fight against Superman, but he’s still one of the best the Marvel universe has to offer, and seeing him finally leap to the MCU should be every fanboys dream. We get to see his highs and lows, as well as the development of the character from the perspectives of many longtime foes and jilted lovers (in some cases, both). It’s a work that will go down in history as of the better self-contained “Daredevil what-ifs” that gives us a glimpse of what many readers fail to consider after having so long been connected to a certain character in a world where heroes and villains alike toe the line between life and death all too often. If anything, I will complain that big reveal comes about just a little too abruptly at the end, but considering I was expecting Matt Murdock to make a surprise “return” at several points in the story, that was the least of my worries. But no, Matt Murdock is G-O-N-E GONE for good in this one, and it makes for a story that affords its hero, as well as those impacted by his life and work, some sense of solace. Some days and nights make us cause very devilish that are bad. Here i am giving you suggestions through writing services canada that makes you a best guide to judge and choose good days.